Farewell to actor & Michigan native Burt Reynolds, who died of cardiac arrest today, September 6, 2018, at the age of 82. Nee Burton Leon Reynolds Jr., he was born February 11, 1936 in Lansing. At age 10, the Reynolds family moved to Riviera Beach, Florida, where Reynolds senior became Chief of Police. Burt Reynolds graduated from Palm Beach High School with numerous football scholarship offers, and chose to play halfback at Florida State University. 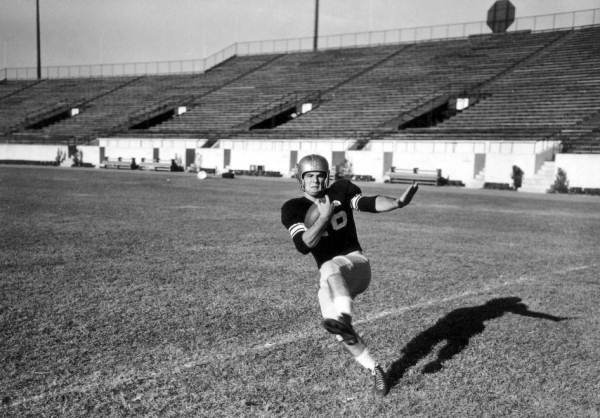 Below, Burt Reynolds in football action at Florida State University circa 1954. A football injury and car accident while still in university ended his NFL dreams, and Burt enrolled at Palm Beach Junior College (PBJC) in Lake Worth, Florida to take extra classes. Reynolds has said that his English teacher and mentor Watson B. Duncan III, encouraged him to try acting; Reynolds won the 1956 Florida State Drama Award for his performance in a PBJC production of the play Outward Bound. With a scholarship to the Hyde Park Playhouse in New York in hand (courtesy of the State Drama Award), Reynolds moved to New York. He got an agent and began acting in stage plays on and off Broadway. Hollywood beckoned when director John Forsythe arranged a film audition for the movie Sayonara, but his strong resemblance to the film's star Marlon Brando lost him the role. Reynolds told Rod McPhee of Mirror in 2015, that he later grew his trademark moustache to avoid being mistaken for Brando. Below, Burt Reynolds is featured as Hoke Adams in the trailer for the 1961 movie Angel Baby, which starred Salome Jens (Jenny/Angel Baby), Mercedes McCambridge, and George Hamilton. Reynolds found longer-term work as half-Native American blacksmith Quint Asper on Gunsmoke (1962-1965). 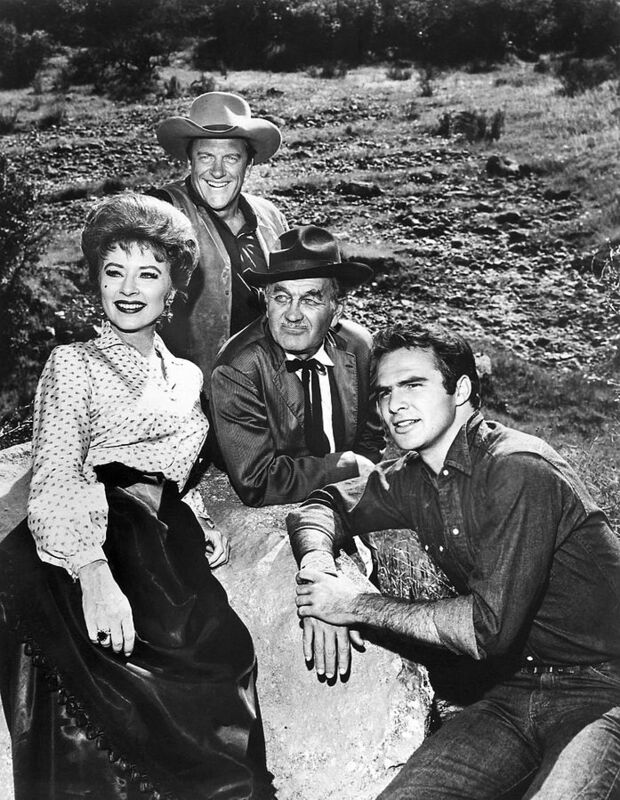 His co-stars on Gunsmoke included James Arness as Sheriff Matt Dillon, Milburn Stone as Doc Adams, and Amanda Blake as Miss Kitty. 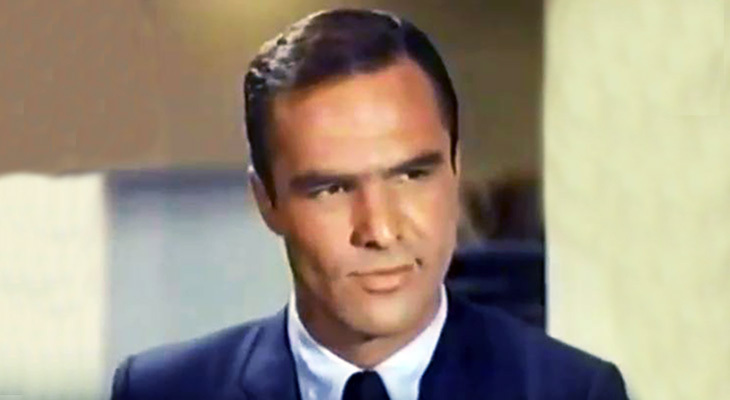 Although Burt Reynolds began finding work on big-screen movies in 1961, his first starring role was in Operation C.I.A. (1965), followed the next year with Navajo Joe (1966). In September 1959 Burt Reynolds was cast as Ben Frazer in Riverboat (1959-1960) television series, for 20 episodes. More episodic television work followed, often in western series popular with baby boomers and their parents. He guest-starred in an episode of 12 O'Clock High in 1965, appearing with series regulars Paul Burke, Chris Robinson, Frank Overton, and fellow guest stars Andrew Prine, Bruce Dern, Peter Mark Richman, and Susan Seaforth Hayes. Below, Burt Reynolds and company in "The Jones Boys" episode of 12 O'Clock High. More movie and television series work followed. Burt Reynolds was married to Rowan & Martin's Laugh-In's "Sock it to" me girl, English actress Judy Carne from 1963-1965. Before she died in 2015, Judy Carne shared details of her bisexuality, and in her autobiography Laughing on the Outside, Crying on the Inside (1985), claimed Burt Reynolds hit her. After Gunsmoke, Burt Reynolds starred as Lt. John Hawk in the TV series Hawk (1966). Although the Hawk series was short-lived, several notable guest-stars appeared on the series during it's short run, including Martin Sheen, Robert Duvall, Kim Hunter, Bert Convy, James Best, Louise Sorel, and many others. A few years later he starred again in Dan August playing another police detective. His co-stars on Dan August (1970-1971) were Norman Fell and Richard Anderson. Subsequent Dan August made-for-TV movies in 1980 re-united him with fellow cast members. 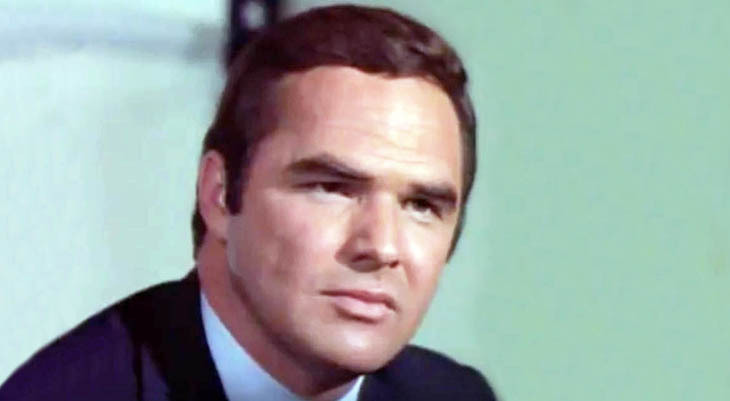 Below, Burt Reynolds in the 1971 "Invitation to Murder" Dan August episode, along with series regulars Norman Fell, Richard Anderson, Ned Romero, and guest stars Tim O'Connor, Michael Strong, and Barney Phillips. 50+ singer and actress and talk show host Dinah Shore had 35-year-old actor Burt Reynolds on her show in 1970. According to the Times of Oman, Reynolds was instantly attracted to her and asked her to come with him to Palm Springs for a weekend - despite the fact he was living with acress Miko Mayama. Mayama moved out and Burt and Dinah moved in together, beginning an almost 5-year romance. Burt Reynolds and Dinah Shore broke up when she refused to marry him because she couldn't have children, although Reynolds wanted a family and was willing to adopt. Burt Reynolds has said breaking up with Dinah Shore was the hardest thing he had ever done in his life. However, Tammy Wynette's biography Tammy Wynette: Tragic Country Queen (2010) relates a story told by her good friend Loretta Lynn, that Tammy Wynette was seeing Burt while he was still in his relationship with Dinah. Dinah Shore died in 1994 at age 77. Burt Reynolds' performance as Lewis in Deliverance (1972) had established him as a bona-fide actor and movie star. His co-stars in Deliverance included actors Jon Voight as Ed, Ned Beatty as Bobby, and Ronny Cox as Drew. More attention came his way when he famously posed naked for a Cosmopolitan magazine centrefold that same year, although he has speculated that it cost him and his dark thriller movie Deliverance Academy Award consideration. Below, the trailer for Deliverance (courtesy Warner Movies on Demand), features Burt Reynolds, Jon Voight, Ronny Cox and Ned Beatty. Burt Reynolds was now a hot commodity - so hot, in the short 5-year span of 1972-1977 alone, he appeared in no less than 16 movies, and turned down the opportunity to play Hans Solo in the debut Star Wars (1977) movie. His starring role as a football playing prisoner in the funny comedy movie The Longest Yard (1974) saw him onscreen with Eddie Albert (Green Acres) as the prison warden, and Bernadette Peters as an amorous prison secretary. Other familiar faces for baby boomers in the cast of The Longest Yard were Ed Lauter, James Hampton (The Doris Day Show), and Richard Kiel. Below, Paramount Movies trailer for The Longest Yard features Burt Reynolds, Eddie Albert, Bernadette Peters, Ed Lauter, James Hampton, Richard Kiel, and other cast members. In the late 1970's, Reynolds began investing (unwisely) in real estate, building the unprofitable 450-seat Burt Reynolds Dinner Theater in Jupiter, Florida (sold in 1990); opening the Burt's Place restaurant and club in Atlanta Georgia, which folded after a year. In addition to homes in Georgia, North Carolina, and California, Reynolds also invested unwisely in sports teams (USFL and NASCAR), and purchased expensive toys - a private jet, a helicopter, and sports cars. Reynolds also purchased an 160-acre property (Burt's Ranch) near Jupiter, Florida and built a movie studio on it. He starred in Smokey and the Bandit (1977), which began the highly successful movie franchise of the same name. While filming Smokey and the Bandit (some of which was filmed at Burt's Ranch) he met and fell in love with actress Sally Field. Below, Burt Reynolds, Sally Field, Jackie Gleason, Jerry Reed, and other cast members from Smokey and the Bandit, in the trailer for the movie. Burt Reynolds and Sally Field would go on to live together for almost 5 years and star in 3 more movies together - Smokey and the Bandit II, The End, and Hooper - before breaking up in 1982. During the filming of the race-car comedy Stroker Ace (1983), Reynolds met actress Loni Anderson, and they began what would be a 10-year relationship. According to a 2015 interview with Ned Zeman for Vanity Fair, it was the following year that Reynolds co-starred with Clint Eastwood in City Heat (1984), and fatefully suffered a broken jaw during filming. He lost 30 pounds and acquired an addiction to painkillers for several years as a result of this injury; eventually going to rehab to overcome his addictions to painkillers and alcohol. Both Burt Reynolds and Loni Anderson have referenced his health issues and addiction to painkillers as taking a toll on their relationship. Despite this, in his 50+ years, they got married in 1988 and adopted son Quinton the same year. Burt Reynolds produced and starred in the television series Evening Shade (1990-1994). He won an Emmy Award for Outstanding Lead Actor in a Comedy Series (1992) for his role as ex-pro football player Wood Newton. While Evening Shade was filming, Reynolds and Loni Anderson got divorced (1993), feuded over money in the ensuing decades. Burt Reynolds declared bankruptcy in 1996 and had to sell most of his properties. Steady work on television and in the movies continued for Burt Reynolds during the rest of the 1990's, including an Academy Award nomination for his work in Boogie Nights (1997). Actors Burt Reynolds, Mark Wahlberg, John C. Reilly, William H. Macy, Don Cheadle, Heather Graham, Julianne Moore, and others from Boogie Nights are featured in the trailer for Boogie Nights, below. "He lives across the street from his mother. I don’t think he’s heard the greatest things from her about me. We talk on the phone, but it’s not a great relationship. I love him so much and I think he loves me, but we don’t spend as much time together as I’d like and it’s hard." As a septuagernarian senior citizen, Reynolds began to experience serious health issues. In May 2009 he underwent had back surgery for injuries sustained over a lifetime of football and performing movie stunts. This once again resulted in Reynolds abusing painkillers and going to rehab. A year later, he underwent a quintuple heart bypass in (February 2010). In his last years, a frail looking Burt Reynolds walked with a cane. In 2015, Reynolds dated new girlfriend Rhonda Stearns, a longtime Florida friend, and appeared in the crime thriller Pocket Listing. In one of his last on-screen film appearances, the now octogenarian Burt Reynolds could be seen co-starring in the feature film Miami Love Affair. Below, Burt Reynolds is featured in the Miami Love Affair movie trailer. Farewell, Burt Reynolds. You will be missed. Note: This article was first published in 2016 under the title Celebrating Seniors - Burt Reynolds Turns 80. It has been updated with new & additional content. Hay Burt, I have been watching your movie this morning (Hard Time) and I think its very entertaining! My wife and I were talking about you and the work you have done in the movies and TV. So we thank you for giving us so many good entertaining films over the years. I worked for the local newspaper as a printer for 41 years until I had a stroke and had to quit, so please make us some more good films and stay close to God!